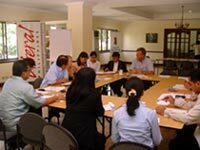 The 50th Meeting of the Philippine Working Group for an ASEAN Human Rights Mechanism (PRWG) was held on January 26, 2005 at the premises of the Friedrich Naumann Foundation in Makati City. Topping the agenda was the group’s assessment of the recent developments regarding the establishment of an ASEAN human rights mechanism. At their recent 10th Summit Meeting in Vientiane, Laos, the heads of state of the regional organization adopted a series of policy decisions. In the context of the so called ASEAN Security Community, the promotion of human rights is listed in a special chapter. The establishment of a network among existing human rights mechanisms and the creation of an ASEAN commission on the promotion and protection of the rights of women and children are two important measures adopted by the governments. The chairperson of the Human Rights Commission of the Philippines, Purificacion Quisumbing, informed the gathering about a first consultative meeting of leading representatives of the Human Rights Commissions of the Philippines, Thailand, Indonesia and Malaysia recently held in Bangkok. She said that the strengthening of bonds between the National Commissions is an important activity on the way to an inter-governmental human rights mechanism in the region. The Friedrich Naumann Foundation has supported the RWG since its inception in 1995. Apart from the Foundation’s sponsorship of its regional programs, FNF Manila has cooperated closely with the Philippine Working Group for many years. “Regarding advocacy of human rights and the promotion of a regional mechanism, Philippine human rights activists and politicians have always played a crucial role,” said Dr. Ronald Meinardus, the Foundation’s representative in Manila.